One of the most enjoyable ways to spend an evening is with dinner at a great restaurant followed by a beautiful Disney fireworks display. The best way to spend an enjoyable evening is to have the great dinner DURING the fireworks display! There are several Disney restaurants from which you can see either Magic Kingdom’s Happily Ever After or Epcot’s Illuminations. Here in Part I of our “Restaurants for Fireworks Viewing” series, we’ll look at restaurants from which you can see Happily Ever After. Happily Ever After is the Magic Kingdom’s nightly fireworks display. It usually takes place at 9:00PM, but it can be earlier or later depending on time of year and the MK’s schedule of special events. The Happily Ever After soundtrack is piped into the restaurants, so hearing the accompaniment to the fireworks will not be a problem. ‘Ohana, one of the two table-service restaurants at the Polynesian Village Resort, has arguably the best view of Happily Ever After from any restaurant. With a wall of windows facing the castle, directly across Seven Seas Lagoon from the Polynesian, the view of Happily Ever After is head-on — just as you’d see it on Main Street in the Magic Kingdom (only farther away). See that blue spot in the middle? That’s the Castle from our ‘Ohana table. The second picture isn’t the best — the castle looks a million miles away — but trust me that it’s a great show from ‘Ohana. Definitely worth booking. And speaking of booking, you’ll want to book a reservation about 30-45 minutes prior to the scheduled time for Happily Ever After. When you arrive at the podium, request a “Fireworks view” table. They cannot guarantee it, but they’ll do their best. If you happen to be seated in one of the few tables from which you can’t see the fireworks, you’re free to move during the show to stand in an area of the restaurant offering a better view. Also, note that if you don’t get a reservation for around fireworks viewing time, the Polynesian Village Beach is another great spot to view Happily Ever After. 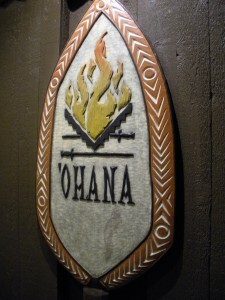 ‘Ohana is a casual dining establishment; standard park-wear is acceptable here. 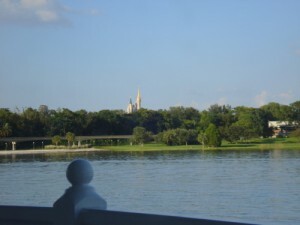 Narcoossee’s, in the Grand Floridian Resort, sits over to the left-hand side of the Magic Kingdom. Several window tables offer a great view of the Happily Ever After fireworks show. Narcoossee’s also has an outdoor viewing area along the railing outside of the restaurant. This will offer a great view if you’ve not yet been seated at your table. Again, book a reservation about 30-45 minutes prior to the scheduled start time for Happily Ever After. Narcoossee’s is a bit fancier than ‘Ohana; you might want to dress up a bit. California Grill, on the Contemporary Resort’s 15th floor, is often thought of as the quintessential Happily Ever After viewing spot. 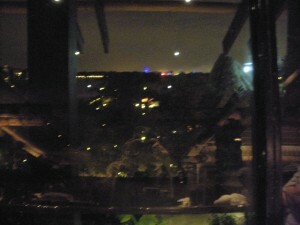 The restaurant offers its outdoor viewing deck in addition to the views from the wall of windows in the restaurant. That said, California Grill isn’t my favorite location for Happily Ever After viewing, as the vantage point is strongly to the right of the castle. As a result, many of the fireworks launched from a mile or so behind the castle are skewed and don’t appear as they would when watching the show from directly in front. However, California Grill definitely has my vote for best food of the three! 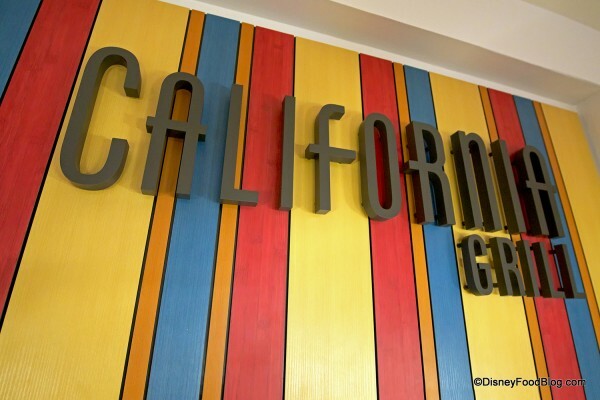 California Grill is another Disney signature dining location, so it’s pricey…and dressy. While these three are clearly the front-runners in dining reservations, you can also see glimpses of Happily Ever After from Magic Kingdom’s Plaza Restaurant, Crystal Palace, Casey’s Corner, and Tomorrowland Terrace Noodle Station. Interesting “views” of Wishes can be had from Cinderella’s Royal Table in Cinderella Castle and Pinnochio’s Village Haus in Fantasyland. While the fireworks are exploding above your head (not necessarily in your view, of course), you can see the flares being released from the tops of Magic Kingdom buildings around you. You won’t be able to truly experience Happily Ever After, but it’s a unique view for anyone who has an interest in pyrotechnics, engineering, or fireworks in general. Restaurants in the Magic Kingdom from which you can see very little — if any — of the Happily Ever After Fireworks display are: Liberty Tree Tavern, Tony’s Town Square, Columbia Harbour House, Cosmic Ray’s Starlight Cafe, Tortuga Tavern, and Pecos Bill’s Tall Tale Cafe. I heard that California Grill pipes in the music and such from Wishes so you can hear it in the restaurant . Do you know if this is true? Allison — Yep, they do! They pipe the music into most of the restaurants that have a clear view of Wishes, so you’re all set! Do you have a reservation there? PS: I’ve also heard that they pipe the music onto the beach at the Polynesian, but I don’t have confirmation… . I do have a reservation there! In October though , do you know do they do the same for the Halloween fireworks display? I’m super excited to dine there , Hubby and I haven’t been there yet. 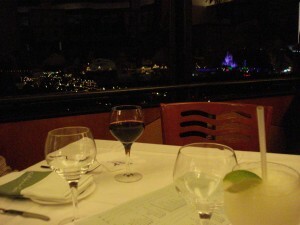 For a restaurant that has such a great view of Wishes, I don’t see much written about Narcoosee’s online. How’s the food? 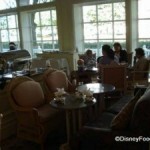 I believe you can go up to the California Grill to sit at the bar, which would not require reservations. But that isn’t confirmed…. James, thanks for your comment. I think you are exactly right! I completely forgot about first come first served at the bar! Gray, Narcoossee’s food is quite good, actually! There are a lot of message board debates pitting Citricos and Narcoossee’s against one another; both are top notch restaurants. 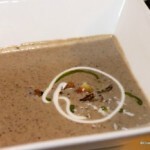 Narcoossee’s is a bit more casual, but my meals there have been delicious. Allison–Yes! They do the same for “HalloWishes!” In fact, I love seeing HalloWishes from one of the restaurants, because it gives you an even better view of the “360 degree fireworks” that go off in a circle around the Magic Kingdom! Fascinating spectacle. Great article! You always hear about CG for Wishes, good to see someone take the time to show that there are other options. Keep up the great work! Thanks, Zach! Same to you over on wdwblog.com! 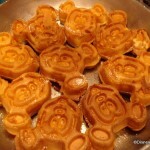 i must try ohana and narcoosees some time! what time and days do these fireworks go off? @Gray I ate at Narcoosee’s once and really didn’t like it. We had reservations, where they told us we would be getting a window seat so we could watch the fireworks. We got there, and they then said they were backed up and we had to wait another hour. When we were seated, the table wasn’t a window seat and was back by the bathroom. Then the food came and I wasn’t very happy with it. Nothing tasted very good. I forget what I had exactly (some sort of fish? 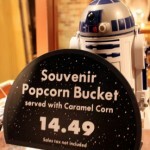 ), but it was really tough and chewy. Portions were tiny, and the presentation didn’t make up for the bad food and high prices. Narcoosee’s is one of the few restaurants that I’ve eaten in at Disney that I definitely wouldn’t return to. Although I personally like the view from the roof of the Contemporary best. There is no better way to watch fireworks than to be above them! (If not eating at California Grill, you can still take the stairs up to the rooftop viewing area). I was watching my two grandsons while my daughter & husband had a nite out. We were swimming in the pool at the Polynesian Resort. Didn’t even think about the fireworks but when they started we stopped swimming & playing. It was one of the best views I’d seen of the fireworks. I’ve been coming to Disney since 1957. Then to Disney World since 1973. Having the two grandchildren age 2 & 7 with me is a memory I’ll hold forever in my heart. We LOVED the view of Wishes from inside Cinderella’s castle. We got to sit at the primo center window seat on our honeymoon, and it felt like we were inside the fireworks when they went off. There were plenty of low fireworks to see, too, and we got some great photos. On the other hand, during our one experience at Ohana, we didn’t even know you could see fireworks because we were seated so far from the windows and the eaves hanging over them obscure so much of the view unless you’re right up close. I have eaten at O’hana during the fireworks. They do have the music piped in and the interior lights are dimmed dramatically making for an amazing viewing opportunity. Our family actually ended up there at that time totally by happenstance; we had not planned it for fireworks viewing. Somehow we got seated by the window and our waiter was kind enough to tell us to eat slow so we would still have our table when the show started. It was my favorite WDW fireworks viewing ever! No crazy mob of people, no standing in one place for hours to hold the perfect viewing spot – just eat dinner, visit with family and wait patiently! No mention of Top of the World lounge at bay lake Tower? 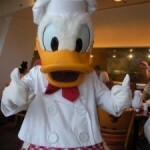 I will be in WDW next week Oct 15-17. It does not show there will be a fireworks show. Is his correct?! I hope not! With all the construction at the Polynesian is the view still the same from Ohana and the beach? Nicole — It’s similar. The beach has some obstruction with the bungalows, but there’s still open beach area.